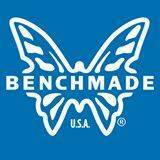 Originally founded in California in 1988, the Benchmade Corporation later made a move to Clackamas, Oregon in 1990 where their manufacturing facility resides today. Although their initial line consisted primarily of Bali-Song knives which they constructed in-house from parts they purchased from other manufacturers, they eventually began to acquire new machines and to develop new technologies including the first of several laser cutting machines; thus making Benchmade the first knife manufacturer to have such equipment in-house. Furthermore, keeping an open mind and a positive attitude lead to several more major innovations over the next several years. But, that was only the beginning of Benchmade‘s venture to break new ground in the manufactured knife market since they also experimented with non-traditional materials and modern manufacturing methods in their quest to build better knives. Therefore, when Benchmade was originally founded, their goal was to produce exceptional quality knives for the most demanding customers from special forces operators to elite back country hunters. Thus, they have created an affordable series of tactical knives in their H & K brand and, their Benchmade HUNT series is specifically designed to meet the needs of dedicated hunters. In addition, their Blue Class of every day carry knives is specifically designed to fill the need for a series of high quality working knives while, their Black Class is specifically designed to be a series of high quality tactical knives and, their Gold Class is a series of elite, semi-custom, knives. Consequently, the Benchmade Gold series represents their highest standard and thus, no expense has been spared when designing the knives that comprise the Benchmade Gold series. Consequently, when you purchase a Benchmade Gold series knife, you are getting one of the best knives it’s humanly possible to manufacture! Of course, as the name implies, the Benchmade Axis Stryker II is part of Benchmade’s Gold series of knives which represents the realization of their original vision by comprising their highest quality, most expensive, series of knives. Built in-house, each Benchmade Stryker folding knife is handmade by Benchmade’s highly experienced team of professional bladesmiths who incorporate the best materials available combined with meticulous attention to detail to create an elite series of knives designed specifically to meet the needs of users who demand the absolute best quality. But, for those of you who are not familiar with the knife, it’s a large, single bladed, folding knife with an open length of 8 1/4 inches and a Drop Point blade with a plain edge made from Odin Heim patterned Damasteel with a Hollow Grind. Therefore, not only will the blade take an exceptionally fine edge, it will hold that edge through extended use. Also, it features an ergonomic handle design with a beautiful set of sculpted handle scales made from carbon fiber which are impervious to cracking, splitting, chipping, and the absorption of moisture combined with a manual opening mechanism and an Axis locking mechanism. Last, it features an ambidextrous, deep-carry, tip-up, pocket clip for convenient access and, it has an overall weight of 4.76 ounces. The blade of the Benchmade Gold Stryker is made from a stainless Damascus steel called Odin Heim patterned Damasteel which is the best performing stainless Damascus steel in the world! Similar in concept to Japanese folded steel, Damascus steel consists of numerous different layers of both soft, low carbon, steel and hard, high carbon, steel, which has been forge-welded into a single billet which is then used to form the knife blade. Thus, by employing the latest gas-atomized powder metal technology to achieve a very high cleanliness, Damasteel has incomparable toughness and strength combined with excellent edge retention and corrosion resistance. Consequently, like laminated blade steels, Damascus steels do an excellent job of retaining their edge while also withstanding lateral stress and impact. Thus, they are an excellent choice for heavy-duty knives. Widely considered to be one of the most innovative knife blade locking mechanisms available, the ambidextrous Benchmade Axis locking mechanism is specifically designed to address the issue of wear over time to the locking mechanism which can eventually result in a loose blade. Like other modern knife designs, when the blade of a Benchmade Axis Stryker is opened, the blade is halted by a large stop pin which rest’s against a notch in the blade’s tang. But, once the blade is fully opened, it is then locked in place by a small, hardened, steel bar that spans the width of the handle and which rides forward in two slots milled into each of the steel liners propelled by two, Omega-style, springs. Consequently, the blade’s tapered tang is then wedged between the stop pin and the Axis Bar which compensates for wear to the blade’s tang to keep the lock tight for the life of the knife. So, if you are a knife aficionado who appreciates the serious investment in time and expense required to hand-make such a high quality knife, then the Benchmade Gold is an excellent choice for an everyday carry utility knife since the stainless, Damascus steel, blade combined with the stainless steel liners and carbon fiber handle scales make for a very tough knife that will do an excellent job of holding an edge while also resisting corrosion. In addition, the Axis locking mechanism is widely considered to be one of the best locking mechanisms available and thus, when all of the aspects of this knife are considered, what may initially seem like an excessive MSRP is actually a reasonable price for such meticulous attention to design, materials choice, construction, and attention to detail.